I don’t know how many are aware that over the past decade or two the aircraft/auto and some other industries have gone to paperless (no blueprint) designs. The design is built and inspected to 3D datasets, or DMUs(Digital Mock-up Units), some of which, but not all, interface to CAM(Computer Aided Manufacturing), mainly auto-fastening, CNC machining, rapid prototype type operations. Begs the question when and how the construction industry is going to get on the same page. How much do we really need on a drawing? It started out about 10-15 years ago with only critical 3d tolerances or GD&T (Geometrical Dimension & Tolerances). There is a general 3d model tolerance applied to all geometry “except as noted” . 3D tolerance is quite different than 2d, 3d needs an axis system or tertiary datum defined. It can get quite complex to produce and inspect, although it can be simplified with loser tolerance for construction. The 3D model also contains notes on a readable plane. Just wondering what some experienced blue print readers thought. Do you need everything defined in 2d on a print. What if a computer station was available at the jobsite and the foreman or lead could provide info, or, what if you were given a power point with 3d pics that defined what you already know after years of doing an reading the same ol, same ol, most of the geometry, that say gave overall dimensions and detailed only what was absolutely necessary. The aircraft-auto industry has drastically reduced to R&D cost of producing 2d drawing’s to the point it is practically gone, paperless, pushing that cost saving’s into more robust builds. Paperless CAD/CAM has been industry standard in the offsite manufacturing side of the construction industry for many years - doors and windows, modular and manufactured housing etc. The CAM part doesn't work on a jobsite though, whatever the current hype about 3D printing may tell you. I do see (mostly younger) supervisors preferring their working drawings as a PDF on an iPad but I think it'll be a while before lead carpenters give up their paper prints. Terry, You may be right about the eventual elimination of paper copies of contract drawings. I would draw the distinction between that and the earlier design development that happens between the architect and client. Using Cad representations to show early conceptual ideas can lead to concretizing parts of the design too early, and losing the expressive quality that hand drawing brings to the process. James Wrote: paperless CAD/CAM has been industry standard in the offsite manufacturing side of the construction industry for many years - doors and windows, modular and manufactured housing etc. Really? What companies and in what capacity is it used? It has been in aircraft and auto at the OEM level 10-15 years, big companies like Boeing, Airbus, Ford, Chrysler, I have worked for are the only ones that can afford it. For the last decade I have seen their small suppliers struggle to just afford the CAD software, now these OEM giants won't do business with those that don't. The smaller multi-million dollar companies, I have worked for even recently, either cannot afford it or the managers just don't understand it. I find it hard to believe small windows, door, and manufactured home companies on limited budget use this as a "standard" perhaps let me know of several you have seen and how they are using it,of course it always nice when making statements like that to be more specific. It cost alot to take a 3d model, to a CNC programmer, to a machine capable of reading it and that is cheap detail part CAD/CAM comparatively, assemble and installation much more costly which is what I am referring to....auto fastening and assembly machines cost a fortune. Rapid Prototype machines are expensive. The CAM part does work on the jobsite, like the other CAMs I just mention cost too much these days, but it will come down as Engineers develop it and the work out job site logistics(assembly and installation tool designs). It just a matter of time, full automation, costly subs replaced by machines. I have seen many jobs lost by machines, including Engineering. As I mentioned the "Drafter" has been replaced by software. The day of an Engineer handing off a 3d model to draft is almost gone. See PIC - The 2 drawing is not gone, it is integrated in the 3d model. If you look at the tree on left you see "notes". The drop down is not shown but it would say something like, frame a 30 x 40 envelope 2x4's OC..instead of cluttering the drawing with dimensions. Just an example. I am entering into a 3d model phase this winter, in hopes of breaking ground this spring. Once I build the 3D model, one thought is to hand it off to a drafter and pay them to do my drawing's, since I am not that good with home building software and it can get expensive. Another thought is loose the drawing, work with my subs and inspectors to replace dimensions with notes, only show 3d dimensions that are absolutely necessary so the model does not get cluttered. If I want to make changes in the future, this software automatically updates the dimension if I move a wall, for example, and all the stored views are updated. Now all design-build is in one place, 3d, I don't have to export to a 2d program, what you see is what you get. Malcom: not sure I follow what you wrote but some people have a difficult time projecting orthogonal 2d drawing views in their mind, the DMU eliminates this confusion between the architect and client, engineer and builder-inspector. This concept is jobsite ready now. I don't know if sketch-up has this capability, I'd hope it can at least store 3d windows and dimensions. If I can get this to work I won't need to purchase pro for 2d, and there won't be a bunch of drawing's around my jobsite. In that respect,, that is the beginning of getting "CAM" to work on a jobsite since my subs and inspectors will be building to a 3d model and I will have a computer station at the jobsite. It's a start. Terry - the overwhelming majority of windows in this country are made by large companies like Marvin and Norco. If you don't believe that CAD/CAM is deeply integrated into their manufacturing process ask your local rep to set you up for a factory tour. Custom door manufacturer Trustile in Denver is totally dependent on advanced CAD/CAM technology, even to the extent of completely eliminating overspray in their paint booth nozzles. The nozzles know where there's a hole in the door blank and simply don't fire there, very much like an inkjet printer. On the design side affordable 3D architectural modeling software with integrated production drawing output has been available for decades - I should know, I've been using it since 1994. Read up on BIM if you want to get current. Malcom - CAD drawings are hard-edged, but keep you honest. Freehand drawings are fast and flexible, but can be misleading. I flip back and forth between the two at the schematic design stage. I avoid detailed computer renderings like the plague until the concept is well developed, seldom use it even then unless it's presentation material for a third party. Clients can get so carried away with photorealistic textures that they suspend their critical faculties on the overall form and dimension. Ooh, plants and people! Aah, bricks and shingles! By the way, have you ever noticed that architectural presentation renderings are awash with cars and people, while for portfolio photographs of completed work architectural photographers will go to great length to eliminate any sign of human activity or extraneous artifact from the frame. What's that all about? James, I think two things are at play. Photographers hate the idea that the house will look dated in the future if it is seen to be surrounded by the people and cars that speak of current fashions. They also seem to view houses as sculptural artefacts unconnected to human habitation. People and their stuff just get in the way of showing how beautiful it is an an object. The renderings can be pretty funny too. Public plazas packed with street vendors and jugglers. Crowds of people made happy by the presence of the new wonderful building. I recently used a drawing on a large-screen tablet to answer a contractor's question about a dimension, while we were standing up outside. It required zooming in and out multiple times to find the right spot, see it clearly, etc. It would have been much easier with a large paper print. I think that using more advanced CAD will happen and will help, but I don't think that replacing paper drawings will be the first change at job sites. By the way, when I first saw the title, I thought someone was trying to do a building that used paperless drywall, and eliminated all the other places there might be hidden paper in the construction materials. James – I gather since you were unable to answer my question as to what capacity companies such as window and door use CAD/CAM you don’t really know. Wood: Performed by simple routers, 3 axis, again CNC, CAM, not CAD-CAM. Fiberglass: Hand lay-up over a machined mandrel in a clean room, draw or vacuum formed under temperature and pressure in an autoclave. The design is in-house, the mandrel and/or pressure plates from a supplier. A Gerber that cuts plies is NC controlled. Lots of effort/man hours developing Gerber flat patterns from the released CAD model vs CAD_CAM no effort. Depending on complexity of the periphery, CAM generated by a scanning a Mylar (plastic blueprint or “blueline”, no CAD interface). Part is inspected to Mylar on a bench. I refer to companies like these as MA and PA shops that produce small sub-assemblies. As I said in my last post detail part CNC is small time, most small companies have. I worked for many of these companies as a design and manufacturing engineer, now consultant, ranging from small to the largest in the world. The larger companies are just now (past 5 years) full-up CAD-CAM (refer the pic above), there is no blueprint. In its place between the designs CAD model and machine operations is a direct interface through firmware or that reads the geometry in the model. Geometry in the model is represented by math, 5th order equations, that are automatically converted to numeric code. There is no programmer, there is no machine operator. I did not need a tour of Marvin’s facility, I called them and validated what I already knew in less than three minutes. If would advise them to replace the fiberglass operation with FDM (Fused Deposition Modeling) as I did for a company in 2013 that shows a large cost savings. FDM is more advanced Rapid Prototype, method of choice for future homes. I would suggest you take that tour. I did not waste my time Norco and Trustile since I am sure the findings would be the same. This industry has not been in-line with big $ aircraft for “decades”, it simply cannot afford it as I said, it is still reliant on the blueprint which is obsolete in a true CAD-CAM environment. BIM: Due to the complexity of gathering all the relevant information when working with BIM on a building project some companies have developed software designed specifically to work in a BIM framework. These packages (e.g. : ArchiCAD, Autodesk Revit, ARCHIBUS EIM with BIM 4.0) differ from architectural drafting tools such as AutoCAD andVectorWorks by allowing the addition of further information (time, cost, manufacturers' details, sustainability and maintenance information, etc.) to the building model. BIM has nothing to do with this topic, other than the model package would be simplified if it incorporated no blueprints. Let’s go back a decade before your started to 1984. I began designing using NCAD (3d wireframe) that was exported to CADAM (2d). No clash, no solids, lots of errors since it was difficult to find interference's or see them. 1988 or so, CADD (3D and 2D same model that “bleed through”, what you see in 3D is what you get in 2D (WYSIWYG). Better but still wireframe. 1990 or so, Autocad and CATIA solid body, CATIA better at advanced curves and surfaces, Autocad tedious line commands, vs command tree in CATIA (see pic, left side above) no CAD-CAM to speak of. 1990 CATIA (Dessault) outdates Autocad at a high price and has a CNC “workbench”/platform. I could brind in solid body cutters (ball, flat bottom, etc) model the cutter paths in my design model, give it to a programmer with little effort to run CNC flat beds. 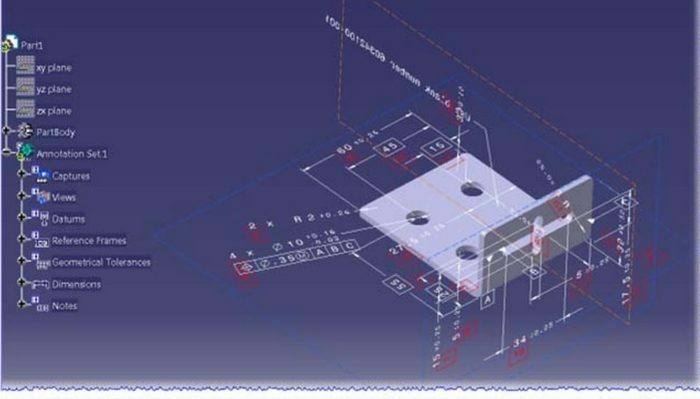 Fast forward a decade, Autocad becomes obsolete to CATIA for CAD-CAM and still is today. I believe Autocad is used extensively in construction, it is incapable of performing larger CAD-CAM operations such as large gantry fastening, assembly, fiber placed composites (this would replace Marvin's fiberglass hand lay-ups someday and is CAD_CAM). I avoid auto cad like a plague... CATIA is what drives FDM, and will for future homes. It is much easier to use and much more capable on MANY levels, it is the pic above. It needs more tailoring-redering for homes to compete with Chief, etc, that lacks CAD_CAM and product design capability. It would be nice to have it all in one software. Charlie: Have you seen the new 2 and 1 touch screen windows 8 lab-tops with a fast processor and graphics card? First off, a DMU model if set up properly is very east to find dimensions since there are few. Second, these computers these days are very fast at zooming to an area of interest at the flick of the hands or fingers. Make no mistake, computer technology will not stand in the way of innovation, user capability will. It took pulling teeth to get some ol school on board, I actually seen some fired. I love innovation, always looking for something new. Subs won’t work for me unless they get with the program. Eliminating blueprints will be the easy part, FDM, site CAD_CAM assemble, auto fastening much more difficult, but it will happen in time as it already is in other industries that 20 years ago could never even remotely imagine it. lot with armloads of wood want to try wrestling with. Agree, no need for a pc in the same hand as a bunch of lumber....The new 2 n 1 PCs are getting bigger, lighter, and brighter....I'm trying out a HP now. As I said, the 2d model is not going away completely, it is integrated in the 3d. I remember the mechanics and inspectors groaning in the beginning, so I produced unreleased drawings when I was a ME. I remember them not signing the design in the design phase when I was a DE. So we took 3d power point pics and have notes and good build plans and part of the design-build data package. We're fortune to have a 48' hauler-RV....we are trying a version of this on a job we just got, huge church framing job we subed on. There are drawing's we can spread out at the job site in the office-rv. My vision will be to put an ALL-IN_ONE on the office wall, I can bring the lead or sub in touch screen and select a stored 3d dimension view, or spin the model fast vs 2d mind projections...it should not be as difficult as building an aircraft already done, and no not every fastener is cad-cam installed, most are installed by a gun just like construction. The only difference is the design-build process is more robust, less costly. It's hard to explain unless you seen it already done.